This past summer I worked on creating an extension off our current Headwaters Trail at Pamplin Historical Park. This peaceful walk at the back end of the park has a supplemental brochure that highlights the interaction between the park’s land itself and mankind–Native Americans, settlers, slaves, soldiers, loggers, preservationists, and tourists alike. When working out the map for the brochure some debates came up about where to draw the different waterways, namely the many branches of Arthur’s Swamp and Rohoic Creek. Each existing map I have seen–whether engineer sketches, Nathaniel Michler’s map, county records, United States Geological Surveys, Google Earth itself–seems to have a different plot. 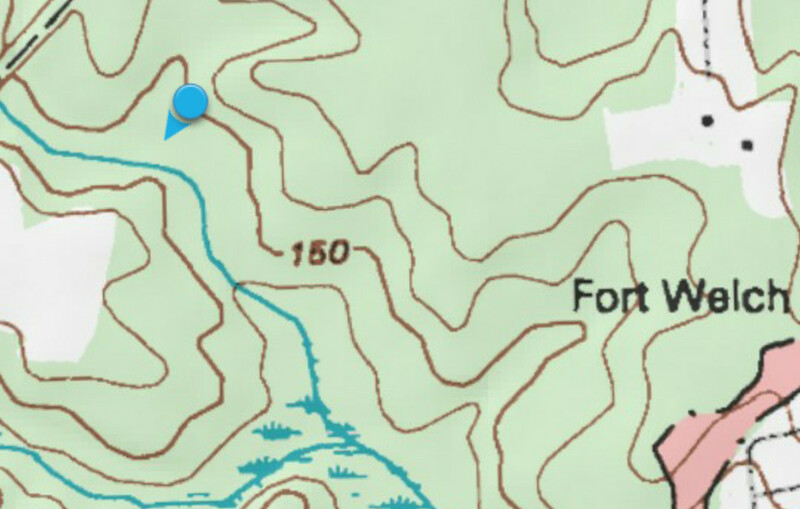 In the interest of settling the question once and for all I armed myself with a pair of muck boots and a snake stick and fired up the GPS on my smartphone to plunge into the swamps for a definitive answer. I found there probably won’t be a satisfying one. I first tramped up Rohoic Creek to its headwaters in the middle of the Civil War Trust’s recently cleared landscape in Dinwiddie County. A drop of rain here flows into the Appomattox River before that empties into the James at City Point. Eventually it ends up in the Chesapeake Bay. 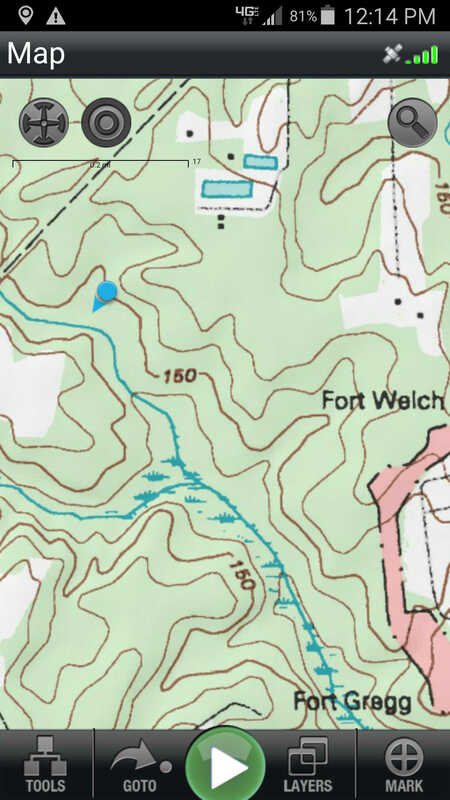 I next worked my way over a short rise in front of Fort Welch on the Petersburg National Battlefield’s Western Front unit. To the south cut a ravine containing Arthur’s Swamp. Rainfall that flows this direction winds up in North Carolina’s Albemarle Sound. The watershed ravine is historically significant for how the Vermont Brigade used it while spearheading the VI Corps’ assault on April 2, 1865. Making their attack at 4:40 in the morning on that decisive day, the low, swampy ground acted as a physical guide in the darkness to the Confederate earthworks. “The ground here was nearly level, dropping off on the left into a shallow, marshy hollow, which narrowed to a ravine next to their works,” wrote Lieut. Col. Hazard Stevens, a staff officer in Maj. Gen. George W. Getty’s division, to which the Vermonters belonged. “It was evident that in the construction of the fortifications the enemy did not deem it important to construct across the ravine, as it was swampy and filled with trees so that it was almost impassable for an organized force,” claimed Brig. Gen. Lewis A. Grant, commanding the six Green Mountain State regiments. While the Confederates may have neglected the land when they initially built their entrenchments in the fall of 1864, over the ensuing months they had cleared most of the trees in the swamp for firewood during the winter. Grant believed he had found the weak spot in the line and centered the left flank of his brigade, advancing one regiment behind the next, in Arthur’s Swamp. Hoping to catch up with their direct path, I continued down into the ravine. This section too had once more been left forested during the large scale clearing from 2012-2014. I used my GPS to try and find the swamp. The map below shows where I first entered the water. Not the most surprising, especially considering that we had about an inch of rain over the previous few days. (This hike was made on September 30th.) But I was surprised to see the marsh extend so far up the hill. And I did learn a few things. First, we could print our maps as is and then give a kindergartner a blue marker to fill in everywhere that needs swamp land shading. But more important, we can’t as historians discount the role of rain and swampy surprises when studying campaigns. Usually when I read about a delay to build a bridge, corduroy a road, find an alternate route, or dig cannons out of the muck, I scoff at how ridiculous it seems. 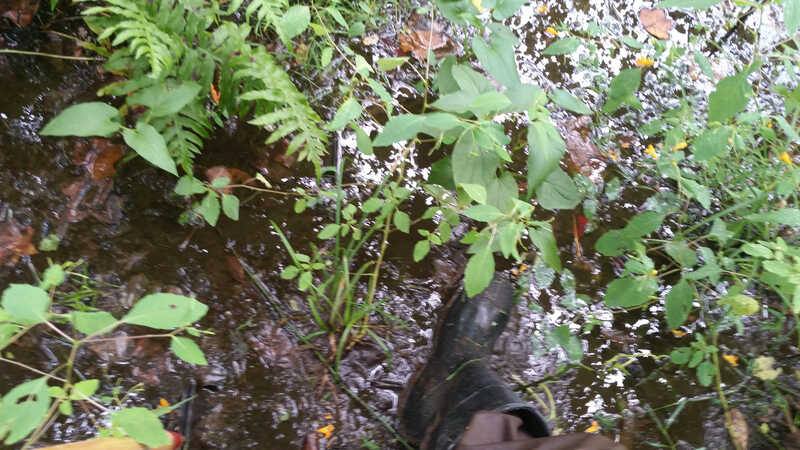 It had rained much heavier the week leading up to the April 2nd Breakthrough than it did before my trek, and Arthur’s Swamp would have spilled out even more into the surrounding barren fields. In the photo above I nearly lost my boot on my next step. I think I’ll give the generals a break next time I read about an untimely delay. This entry was posted in Battlefields & Historic Places and tagged Arthur's Swamp, Civil War Trust, Pamplin Historical Park, The Breakthrough. Bookmark the permalink. Bravo ! Boots on the ground report ! I think about that when I think about Stoneman’s delayed start at the beginning of the Chancellorsville campaign. It’s easy to forget how hard it actually was back then crossing a river when the rains were heavy or traveling quickly when the roads were muddy. Good reminder, Edward!